Angela Dunne is the managing partner of Koenig|Dunne where her career has focused exclusively on divorce-related work. Angela is a fellow of the American Academy of Matrimonial Lawyers, a Martindale Hubbell AV Rated Attorney, was named one of the National Academy of Family Law Attorneys Top Ten Attorneys for the State of Nebraska, a Super Lawyers 2014 and 2015 Rising Star, 2017 Great Plains Super Lawyer, and was voted Best of the Big O’s Best Divorce Attorney multiple years. She is a highly skilled negotiator and litigator representing individuals in all facets of domestic relations. Angela’s focus is on assisting clients during their time of tough transition by providing support and clear direction to their path. She helps clients view their options from an enlightened lens. Angela’s greatest contribution and joy is found through encouraging, educating, and empowering her clients. 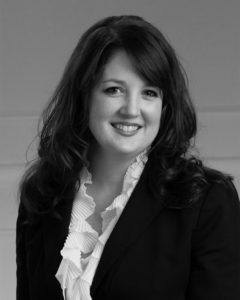 Angela earned her Bachelors of Arts degree from Nebraska Wesleyan University and went on to obtain her juris doctor from The University of Nebraska College of Law in 2000. Angela joined the law firm of Susan Ann Koenig in 1999 and began practicing law in 2000. Angela is a member of the Nebraska State, American, Nebraska Women’s and Omaha Bar Associations. She previously served on the Executive Committee of the Family Law Section of the Nebraska State Bar Association. She is admitted to practice in the Supreme Court of Nebraska and the U.S. District Court for the District of Nebraska. Angela was appointed by the Chief Justice of the Nebraska Supreme Court to serve on the Nebraska Child Support Advisory Commission, making their recommendation to the Nebraska Supreme Court and served on the NSBA Ad Hoc Committee to discuss the Parenting Act issues which were raised in the Nebraska Legislature. In 2013 Angela Dunne co-Authored the second edition of Divorce In Nebraska: The Legal Process, Your Rights and What to Expect with Susan Ann Koenig. She has taught numerous divorce related seminars for the National Business Institute including Divorce Law from A to Z.
Angela authors the blog, “Doing Divorce: A Thoughtful Discussion About Divorce,” which provides guidance, insight, and practical advice to help people transition through divorce with clarity and grace, which has a national following. 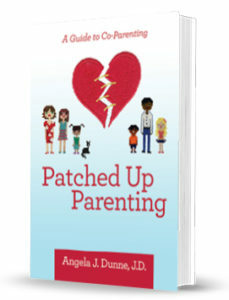 In the fall of 2018, Angela released her book Patched Up Parenting: A Guide to Co-Parenting, providing a guide to help overcome the challenges of post-separation parenting – and practical advice and tips that empowers mothers and fathers to parent better no matter the circumstances. Click HERE to schedule an initial consultation with Angela.